The quartz glass is very pure and provides good transmission and temperature resistance. The unique twin tube design offers high radiation power and very good mechanical stability allowing emitters of lengths up to 3.5 meters. Emitters are available in Short Wove, Medium Wave, or Long Wave versions. That gives you the possibility to select the optimum wavelength for the material to bo hooted. Dimensions and filaments are matched to requirements. 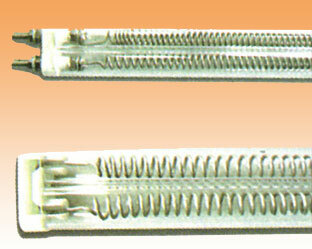 Twin Tube Infrared Heater is made by virtue of a gold & white coated which con emit heat directly to the product. A coating on the infrared emitters reflects the infrared radiation. Consequently the infrared radiation impinging on the product is virtually doubled.